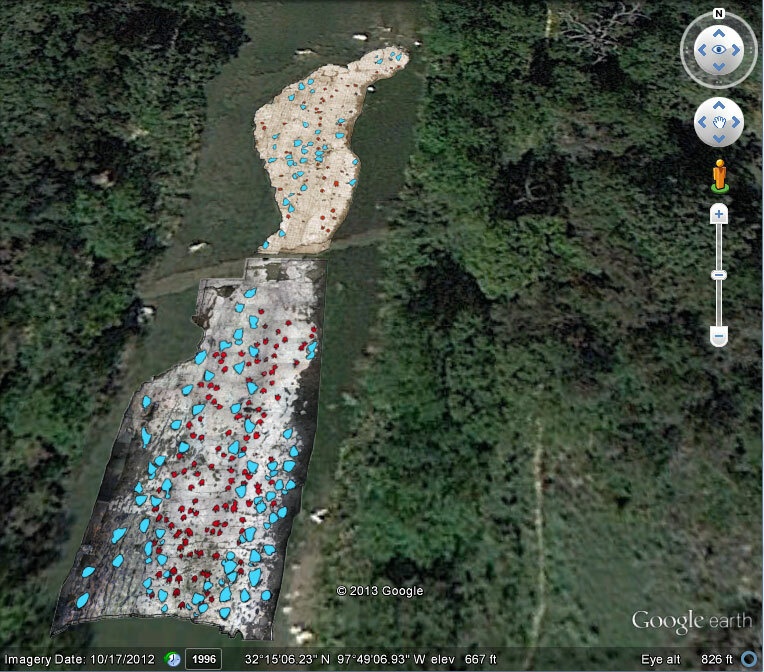 Watch video of the dinosaur track mapping project. Sauropod tracks, large elephant-like tracks believed to have been made by Sauroposeidon proteles. Theropod tracks, smaller and often with a distinct three-toed pattern, believed to have been made by Acrocanthosaurus. Some of the theropod tracks are classified as "elongated" because the dinosaur was walking on its metatarsal bones. Many of these tracks do not show the typical three-toe pattern because the tracks were made in runny, deep mud, and the toe impressions were buried. For each site listed here you will find one or two downloadable KMZ files. These are compressed versions of Keyhole Markup Language (KML) files that you can open with geospatial software like Google Earth, ArcGIS, and other mapping software apps. The photo mosaic files mostly contain photos taken during the mapping project in 2008 and 2009, and some photos from earlier. These allow you to see the track sites as they looked during the mapping project. To see an area's track site maps, open the photo mosaic file first. Next, open the tracks overlay. You will see the tracks overlaid on top of the photos, with sauropod tracks in blue and theropod tracks in red. The photo mosaic files are four to six megabytes each; the track files are much smaller. If you are having difficulty opening these files directly from this web page, you can save them to your device first, and then open the files using Google Earth, or other mapping software that can display KML files. If you have a mapping device or mobile computer/smartphone that supports KML files, and that can show your location using Global Positioning System (GPS), then you can view these files with your location marked. You will be able to find the tracks, even if they are not visible because of river conditions. You can also download the Dinosaur Valley State Park trails data (KMZ) to see where the tracks are in proximity to the trails. Drawing of a Sauroposeidon proteles and an Acrocanthosaurus by Mike O'Brien. The Ballroom - The largest site in the park gets its name from the many directions of the tracks, as if the dinosaurs were dancing. This site contains nine very large (36 inches long) sauropod tracks with mud swells rising 8 inches above the surface. Ten smaller (22 inches long) well-preserved juvenile sauropod tracks show evidence that a young sauropod was being pursued by a theropod. The most abundant tracks at this site are theropod and range from about 6 inches to about 18 inches long. Some of the tracks form the patterns of trails, but most do not. Some of the theropod tracks in this area are elongated tracks. In some of these tracks you can see the impression of the dewclaw. Many of the tracks here show signs of slipping and sliding. This track site is often covered in sand and mud. Sometimes only the mud swells surrounding the large sauropod tracks show. The best time of year to see this track area is in the late summer when water levels are lowest. The Ballroom Annex - Located just northeast of the Ballroom, the Annex is about 160 feet long and no more than 20 feet wide. It has several eroded sauropod trails headed in a southwest direction, as well as many well-preserved theropod tracks. This site is eroding quickly, and the photo mosaic file shows a large area of tracks present in 1985 that are now gone. The Blue Hole - This site is a small (12 foot by 7 foot) ledge with only theropod tracks. You can usually see this site under a few inches of water, and often from the top of the bank. The North Blue Hole - This site is about 132 feet long and 10 feet wide, with four recognizable sauropod tracks. The ledge also has some very deep theropod tracks ranging from 22 inches to about 8 inches..
Opossum Site - This site is in the bed of Opossum Creek, which feeds into the Paluxy River. The site is relatively small with mostly theropod tracks. It is not easy to get to, but the tracks here are usually dry and easily seen. This area's eight track sites are part of a foot thick layer of limestone called the Main Layer. Most of the sauropod tracks in this area point south, suggesting that the dinosaurs traveled in herds. with the tracks overlay in Google Earth. The Main Ledge - This 20-foot by 10-foot area across the river from the parking lot has both types of tracks. This site is usually dry and good for viewing. The tracks here are constantly being uncovered from the bank of the river. They erode almost as fast as they are uncovered because the usually dry site is exposed to freeze and thaw cycles during the winter. The Main Site - This area (50 feet by 15 feet) has a long sequence of sauropod tracks headed south. Several nice theropod tracks are here, one so deep the toes form tunnels. The south end of the site has some long furrows that have not been positively identified. Explanations vary from dinosaur tail drags to driftwood dragging the mud as it floated in the tide. This site is usually dry and good for viewing. The South Main Site - This is about 22 feet by 13 feet and is usually dry. Only theropod tracks are visible at this site. The Bird Site - This site is about 200 feet by 40 feet, is usually underwater, and is just south of the Main Site. R.T. Bird first identified the tracks of the dinosaur, now called Sauroposeidon proteles, here. In 1940, Bird and his workers excavated a large group of tracks. About half of the site has eroded since then and many of its tracks have disappeared. At the south end you can see three trails of sauropod tracks. Two are headed south, but one trail cuts across them headed west. The Ozark Site - This is directly across from the Bird Site, attached to the east bank of the river. In 1940, this track site was attached to the Bird Site but has since broken off due to erosion. The site is usually underwater, but if the water is clear you can see four long trails of sauropods headed south. Alongside them, theropod tracks run both north and south. The Mid-Ozark Site - Just south of the Ozark Site, this site contains both types of tracks. One trail is clearly headed in a western direction and the others seem to be headed south. It is difficult to see the pattern of these trails. This site has lost about 1/3 of its area since 1969. The South Ozark Site - This is just south of the Ozark Site. Five or more sauropod trails head mostly in a southern direction and show distinct patterns. This site has many theropod trails, mostly headed north and south. The Main Crossing - This is an eroded section of limestone that contains only a few sauropod tracks. Be careful if you walk across the river while water is flowing, as the concrete roadbed is very slippery from algae growth. The mud swells of a few sauropod tracks rise above the sand on the east bank of the river just north of the roadbed. The Overlook (CLOSED) - The overlook is part of the Main Layer. It once had several theropod trails but they have mostly eroded. The viewing area above the river has been closed because it is unstable. You can see a few tracks close to the ledge on the south bank of the river. Four track sites were originally part of the Main Layer. In the 1980s, Denio Island was connected to the Denio track site. This site has disappeared due to erosion. Iris’s Site - This trail of weathered sauropod tracks head in a southwestern direction. The Denio Site - This area gets its name from Denio Creek. Its one trail of sauropod tracks is so eroded that the direction cannot be established. This site has many good theropod trails and tracks. One theropod trail of elongated tracks goes on for about 60 feet. The north end of the Denio Site has lost about 50 feet of track-bearing limestone since 1980. The Denio Island - When the park opened in 1972, the Denio Island Site was connected from the south to the larger Denio Site. Erosion separated them, and in 2011 it was washed away completely. The B.P. Baker Site - This is the most southeastern of the park's track sites, and has several theropod trails and tracks. Billy Paul Baker was the park's longtime superintendent. Area 5 is on the southwestern end of the Paluxy River as it enters the park. These track sites were made later than the Main Layer tracks, and lie in a layer of limestone called the Taylor Layer. Many of the tracks look different from their Main Layer counterparts. They can be hard to see even when the river is dry because some of the tracks are in-filled by harder sediments. Most of the tracks in the Taylor Layer were made by theropods. To see several unmapped theropod trails, walk the river downstream from the Bend Site about 1,200 feet. The Bend Site - This site is remarkable for the many small shallow theropod tracks close to the limestone ledge on the east bank. The Lone Ranger Site - A very long, unbroken theropod trail heads southwest at this site. This is the longest theropod trail in the park, at over 350 feet. These tracks are very deep and the trail is crossed several times by other theropod trails headed in different directions. At the southwest end of the trail the tracks have eroded, but they seem to reappear further south in the Taylor Site. Gravel and mud often cover much of the trail. The West Taylor Site - This is a crossroads for many theropod trails headed in various directions. Many of the tracks here are in-filled and difficult to see. Some of the tracks are the elongated type. The East Taylor Site - A group of in-filled tracks that are difficult to see.